The results of prospective cohort studies suggest that fish and omega-3 fatty acids are associated with a low risk of fatal heart attack, sudden death and cardiovascular diseases in general. The Alpha Omega Trial showed that low-dose supplementation of the omega-3 fatty acids eicosapentaenoic acid (EPA) and docosahexaenoic acid (DHA) and of alpha linolenic acid (ALA) did not reduce major cardiovascular events in patients that had a heart attack. In contrast to earlier trials, the omega-3 fatty acids did not reduce major cardiovascular events in the more recent trials. This may be a consequence of the current state-of-the-art drug treatment of elevated blood pressure, elevated serum cholesterol and the risk of thrombosis and may have resulted in a low absolute risk of cardiovascular events. In that situation, it is much more difficult to show an effect of omega-3 fatty acids on major cardiovascular events than in the situation of a high absolute risk as observed in the earlier trials. 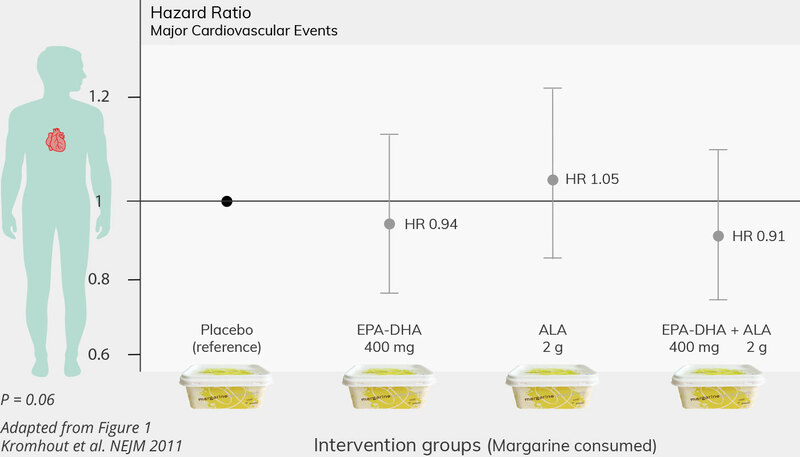 The patients consumed, on average, 18.8 g of margarine per day, which resulted in additional intakes of 226 mg of EPA combined with 150 mg of DHA, 1.9 g of ALA, or both, in the active-treatment groups. During the follow-up period, a major cardiovascular event occurred in 671 patients (13.9%). How much of the fatty acids did the subjects consume? Low-dose supplementation with EPA–DHA or ALA did not reduce the rate of major cardiovascular events. n–3 fatty acids and cardiovascular events after myocardial infarction. Kromhout D, Giltay EJ, Geleijnse JM for the Alpha Omega Trial Group. N Engl J Med 2010;363:2015-2026.
n-3 Fatty acids and cardiovascular events. Reply to letters to the editor. Kromhout D, Giltay EJ, Geleijnse JM. N Engl J Med 2011;364:880-881. Effect of low doses of n-3 fatty acids on cardiovascular diseases in 4,837 post-myocardial infarction patients: design and baseline characteristics of the Alpha Omega Trial. Geleijnse JM, Giltay EJ, Schouten EG, de Goede J, Oude Griep LM, Teitsma-Jansen AM, Katan MB, Kromhout D for the Alpha Omega Trial Group. Am Heart J 2010;159:539-546.